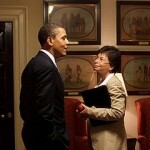 Valerie Jarrett speaking with Barack Obama. Senior advisors to the president aren’t often mistaken to be the president. Nor are they often accused of micromanaging the White House’s affairs or clutching onto authority via incorrigibility and favoritism. But Valerie Jarrett is an exception. Jarrett has endured spates of attacks on her legitimacy since the forthcoming of a GOP-ruled Congress – which she brushed off with hues of social equality. 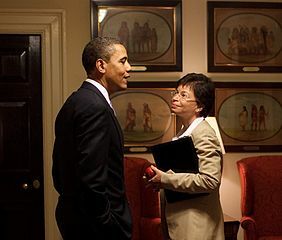 But the Obama administration, humbled by the midterm elections, continues to traverse the terrain between Republicans and Democrats with a contentious “boardroom liberalism,” as Noam Scheiber titles it – and the philosophy seems to be propped up by Valerie Jarrett herself. Boardroom liberalism, as defined by Scheiber, is one “steeped in social progressivism, in the values of tolerance and diversity” by “[presuming] a dominant role for large institutions like corporations and a wisdom on the part of elites.” This doesn’t sound all too bad until one witnesses the degree of compromise it has demanded from the Democratic ideology. Jarrett is accused of shady ethics in her loyalty to “establishmentarianism” as her efforts in outreach for LGBT rights, immigration policy, and relief from the Great Recession have been watered down by this degree of compromise. Jarrett’s extravagant aesthetic and business choices also conflict with the Democrats seeking freedom from business-oriented politics. And this has allegedly had an even greater influence on President Obama. President Obama is earnestly defended as a man who intended to bridge the divides between Republicans and Democrats, but his devotion to a higher, abstract notion of compromise ultimately led to the demise of his party — not necessarily because Americans don’t share his intentions, but because they see his inability to be strict on his policies as an evasion of responsibility. Being totally compliant can often lose just as much as a refusal to cooperate can. As Scheiber reports an activist as venting during an outreach effort managed by Jarrett, “It does make it hard for dissenting voices to be raised … Almost everything is raised to the level of personal loyalty.” Admittedly, the president’s priority of conduct is a unifier, but not when in exchange with the values that unify his party. In an attempt to be above partisanship, the president has deepened partisan politics like never before.